A sight new students will soon get used to as they move around campus is the ongoing construction of the new Henry Madden library. The construction site lies across from the University Center next to a walkway between campus and Parking Lots D and E.
The library expansion will cost between $95 million and $105 million. It will include four stories of technologically advanced workstations and design, and the capacity to hold up to 2 million books. It will be the largest library in the California State University system, and the largest academic library between Los Angeles and the Bay Area. â€œConstruction continues to progress at a steady pace,â€ Project Manager Sara Wallet said. Concrete was poured for the floors over the summer and prefabricated concrete walls will be installed this fall. Steel beams for the 350,000 square-foot structure were completed in mid-July. About 3 million pounds total, the amount of steel is about average for a structure this size, Wallet said. The steel includes 1,913 beams, 177 columns, 9,742 plates and 5,451 bolts. Swinerton Builders, which is responsible for building the library, has occasionally closed the walkway at the east end of the construction site or coordinated foot traffic around it as the situation demanded. All updates affecting pedestrians will be posted online, Wallet said. Peter McDonald, dean of the library since last February, said itâ€™s still a challenge to envision what the new library will ultimately look like because the design plan continually gets modified. â€œWe play an integral role in deciding what goes in the new library,â€ McDonald said of his staff. He said he was more concerned with changing the spirit of the new library to be more inclusive and comprehensive with additions such as large auditoriums, a cafÃ© and comfortable study areas for students along with individualized workstations. McDonald said there has also been talk of bringing Student Affairs into the library, either the whole department or as a satellite office, to offer services such as a Learning Center, Writing Center, and Center for Students with Disabilities. Technology in the new library will be greatly enhanced from what is currently available, McDonald said. Innovations will include state-of-the-art classrooms, multi-media creation abilities, and an ambitious project to digitize objects in the library, including text, print, audio and video materials. “We’re looking at an interactive and transformative online presence that is more robust,” McDonald said. He said the online capabilities would be in wireless form. In addition, part of the interior will have a distinctive Native American feel to it, McDonald said. As a result of a $10 million donation to the library made by Table Mountain Rancheria last fall, the builders will work to design parts of the interior with such things as Native American-styled furniture, interior design motifs reflecting the native culture, and a â€œnative gardenâ€ showcasing plants historically used by local tribes. Access to library books has been affected by the construction. The bulk of the libraryâ€™s collection is held off campus, McDonald said, but the turn-around for book requests is fast and efficient, usually within 24 hours. Book requests can currently be made online from the library Web site or in paper form at the library. Students have access to most of the library study space they did before in the sections that are still open. The Web site also provides a map of alternate study sites around campus. 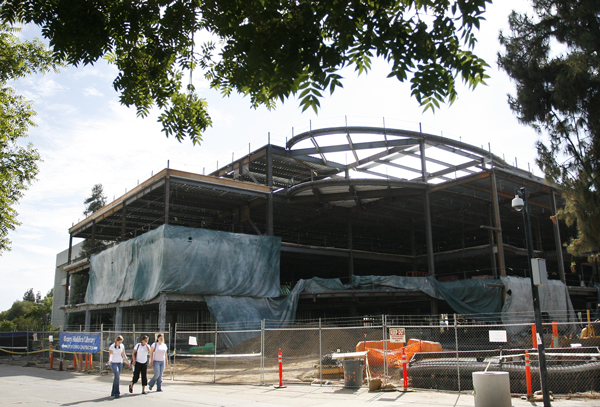 For this and other library information, including a current view of the construction via webcam, visit the Madden Library’s homepage. McDonald said the library should be fully open by January 2009, with public use beginning in stages in late 2008.